With narrow provincial streets and squares densely planted with trees, small houses, old churches and gardens, Velikiy Novgorod feels like a place where time stood still. Velikiy Novgorod is one of Russia’s most historically significant cities. The city was first mentioned in chronicles as early as 859 AD. Located 342 miles to the northwest of the capital and 112 miles from St. Petersburg on the Volkhov River, the city was once the mightiest and richest princedom on Russian lands after Kiev. Despite its distance from the capital, Novgorod is especially beloved by tourists and is the country’s most important cultural centre. If you wish to see the real Ancient Rus, then you must visit this place. Moreover, everything needed to comfortably see the city and its surroundings is in place: hotels, restaurants, even a sandy beach by a fortress wall in which hundreds of student-archaeologists hold annual excavations. In spite of all the benefits of civilization that are available, it’s no use imagining that this is a modern, noisy megapolis. Finding yourself on its narrow provincial streets and its squares densely planted with trees, you will start to think that time stopped here long ago; small houses with gardens, old churches, and the brick walls of the Kremlin that haven’t changed since the day of its foundation and have stood here for centuries. 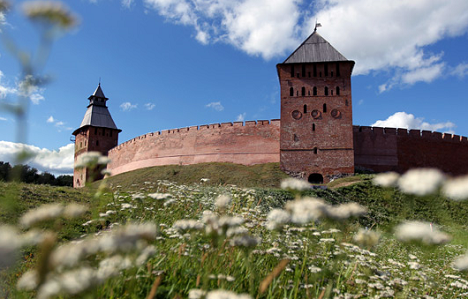 Today Velikiy Novgorod and its surroundings are known best of all for their cultural heritage. One of the richest ancient Russian lands and the only princedom that was not crushed and did not fall into decay during the 9th to 13th centuries, it has been praised for its architecture. No other city in Russia has preserved such a large number of stunning architectural monuments and monumental paintings; there are more than 50 of them here. In 1992, 37 of them were included on the UNESCO World Heritage Foundation list. The city is located on the Volkhov River and divided by it into two parts: Torgovaya (Trade) on the right side and Sofiyskaya on the left side. The main tourist attractions are located on the Sofiyskaya side. The Detinets (the name of the local Kremlin surrounding the old part of the city), the Granovitaya Palata (Chamber of Facets), the Church of Andrey Stratilat, and, of course, the marvelous Cathedral of Saint Sophia the Divine Wisdom, which the entire section of the city was named after, is located here. The scale of the cathedral is impressive. It was built between 1045-1050 after the form of a similarly grandiose cathedral in Kiev, then considered the main place of pilgrimage for Christians, and is the only 9th century architectural monument preserved down to this day. The excellent preservation of all of the monuments in this region is explained by the fact that the Novgorod lands, out of only a few did not undergo the Mongolian invasion in the 13th century and was left untouched. The huge monument “Millennium of Russia,” cast in 1862, was installed on the broad, refined square in front of the cathedral in honor of the celebration of the state’s thousand-year anniversary. Ten centuries of history are represented in main events and figures. On this side of the Volkhov is located the public offices building in which the Novgorod Museum of History, Architecture and Art can be found, with a stunning collection of ancient icons that are the original Russian cultural treasures. The economic center and busiest area of the city, the Torg, was located for many centuries on the right bank of the river, across from the Detinets; this part of the city was named after it. The market stalls ran perpendicular to it from the bank of the Volkhov. In the 16th century approximately 1,800 shops were counted, not a small number even by today’s standards. Just behind the Torg were the “courtyards.” It was possible to find goods from all over the world here: on the site of the modern Hotel Russia, directly next to the Volkhov, was the Gothic Courtyard (established by merchants from the island of Gotland); nearby were the German, as well as the Pskov and Tver compounds. Along the shore there is a long row of piers where ships moored with goods. During Soviet times, Novgorod was one of the few cities in the USSR where it was permitted to bring tourists on excursions. It is now indicated in the majority of Western travel guides for Russia as the third most important city after St. Petersburg and Moscow. Notwithstanding the fact that the city’s situation is no longer as important as it was, the fame of its bygone greatness is known to all.